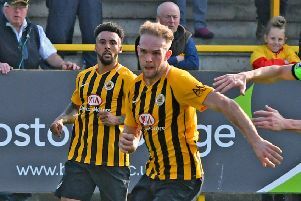 Boston United news. Photo: David Dales. Kyle Tate grabbed the Pilgrims’s consolation, but the visitors proved too strong in this National League U19 Alliance fixture. United return to action when they travel to face Rugby Town on Wednesday (KO 2pm). UNITED: Frestle (Ivanov 46), Rodger, Gray, Horniman (Tucker 66), Stevens, Young, Gaukroger, Armond (Barrett 81), Holland (Tate 43), Bark, Jackson.